This self-paced training DVD in nine video chapters discusses numerous tips and tricks, time savers, media management and other techniques for working FCP HD 4.5. Moderated by Steve Martin, of Ripple Training, the DVD-ROM has a Director-based interface that plays on a DVD computer drive, but not your set top box. Martin's content is well delivered, useful and to the point. Its target audience is intermediate and advanced FCP users, although advanced beginners can also learn. The DVD is menu-driven with chapters containing narrative and video information in power logging, cutting for dialogue and action, timeline timesavers, sequence secrets, audio tips/suggestions, media management, finishing, and an excellent chapter on working in a 24P timeline. Roll your mouse over each of the buttons for the chapters and a summary of its contents is provided. Click on the button, the Martin's narrative techniques play in the video window. Buttons start, stop, and pause the display, and move you to other chapters. The DVD basically provides techniques to streamline and make your editing more efficient and productive. Martin has both identified recurrent issues for editors and provided ways to resolve those issues to speed the editing process. Each of the main chapters includes subchapters dealing with specific issues, techniques, solutions, and suggestions. For example, the Power Logging chapter is divided into six sub chapters dealing with various techniques that include "capture first, log later," "logging with extended markers," " recapturing clips with no audio," and using Excel to create a batch list. Other topics include how to use DV Stop/Start Detection for a non-DV clip, particularly when logging with extended markers. What is provided here is representative on how Martin's suggestions are designed to speed workflow. 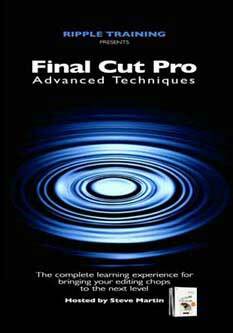 Most techniques are accompanied by detailed narrative and screen shots of the applicable part of FCP, Cinema Tools, or whatever program is being discussed. For example, one section explains how to convert a telecine log to a batch list with Cinema Tools. Extensive screen graphics from each program are provided and accompanied by detailed, clear narrative. Martin provides project files to explain many of his techniques. This approach allows users to follow along with the narrator, which in my view significantly enhances the learning experience. Martin also suggests an approach to editing rather than merely explaining what the editing tools do. Again, in my view, this is a better way to teach. The section on working with 24P is one of the best illustrative explanations for understanding advanced and standard pulldown I've viewed. A chapter is included for outputting to a progressive scan DVD. There is an explanation of aspect ratios used for video and film as well as the application of widescreen filters to a standard definition video footage. Martin does a good job of detailing how to work with native 16:9 video footage with higher end cameras and footage shot with an anamorphic adapter. Sections on audio issues, sample rate problems, and outputting your audio mix are also detailed. A short discussion of on using Peak Express to normalize audio in your sequence is provided. There are additional sections in the "Managing Media" chapter that deal with sub clips and unused clips, off line to on line, and copying a project. The last chapter deals with issues common to producing final output for broadcast or other delivery medium. Sections on broadcast safe, audio distortion, adjusting output levels, calibrating timecode, editing to tape, and timecode window burn are included among others. Again, these issues are fairly common to all editors, and Martin's suggestions are excellent. Fifty tutorials and four hours of material are included. Project files are included for the user to follow along. The DVDs also has a DVD SP and LiveType tutorial, and dozens of older video tips as standalone QT files. All the good teaching aids follow a similar format: good narrative, representative on screen captures of the target application illustrating the technique or suggestion, tutorial files, and random access to the information to facilitate self paced learning. The only other variable is content ­ which must be good, and in this instance, make good editorial sense. This DVD squarely meets these objectives.